In order to spread long-term investment values and competences among professionals, LTI@Unito organizes an executive education program. Objective: discuss tools, methods and techniques of LTI. Target audience: executive mid and senior staff of LTI. Duration: 6 independent modules, one module per month, three days per module. Single modules can be attended too. Starting date: October 11th, 2018. A block provides participants with a common knowledge information about LTIs, their distinctive features and heterogeneous traits. 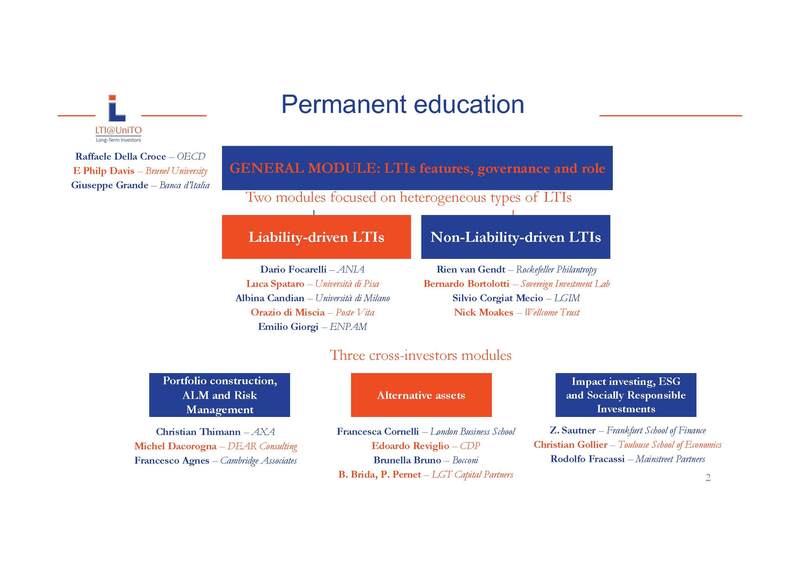 Two blocks analyze in depth the different types of LTIs, distinguishing between liability-driven LTIs and non-liability-driven LTIs. Three more blocks of interest to professionals from all backgrounds: they explore portfolio construction, ALM and risk management, and focus on asset classes which typically match LTIs’ horizon and goals, i.e. alternative and private assets, ESG and impact investment.